Some cars are parked near the water. When we draw a line from the sixth pole slightly right along the bush, it is the first line of sight. Then from the third pole alongside the cars is the second line of sight. The cameraman is standing where the lines cross. This screenshot show us where the GRADs are positioned. We can see two here. One already fired. That's when the boys start filming. Then the second starts firing and this is recorded. 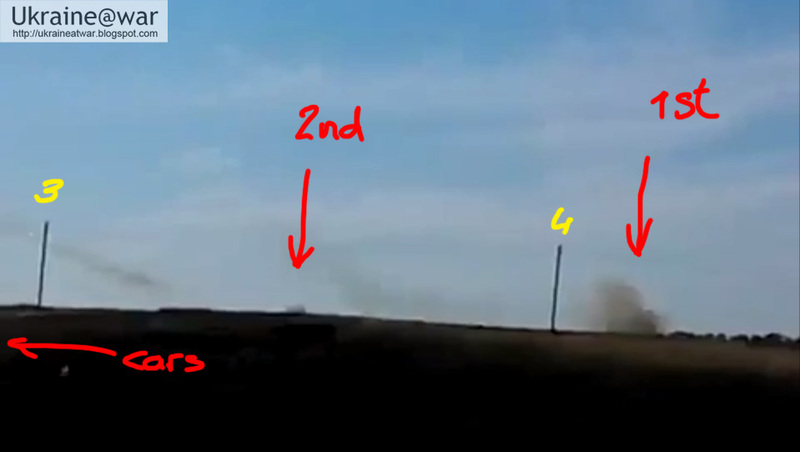 The black smoke shows the positions. Now we can draw two lines starting from the location of the cameraman. One goes between poles 3 and 4 and the other slightly right from number 4. The speed of sound is 340 meters per second. Visually the last rocket-engine disappears at 40:11. The sound stops at 47:05. It means there are 6 seconds and 18 frames in between them, which is 6,75 seconds. That means the distance is 2.295 meters. The reddish circle is a distance of 2.300 meters. 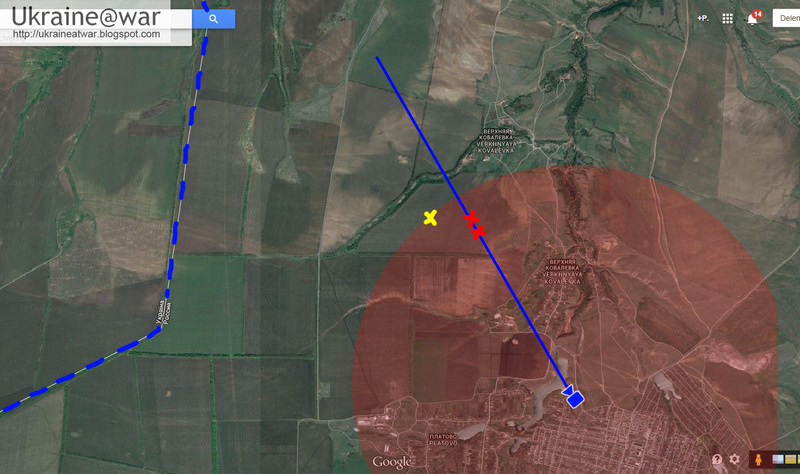 The yellow line is the direction where we last see the rocket engine. That means that rocket is at the yellow cross. And THAT means the launcher is somehwere at the red crosses. When the first launcher is in visual range of the other, it must be between the green dots and is at the orange cross. 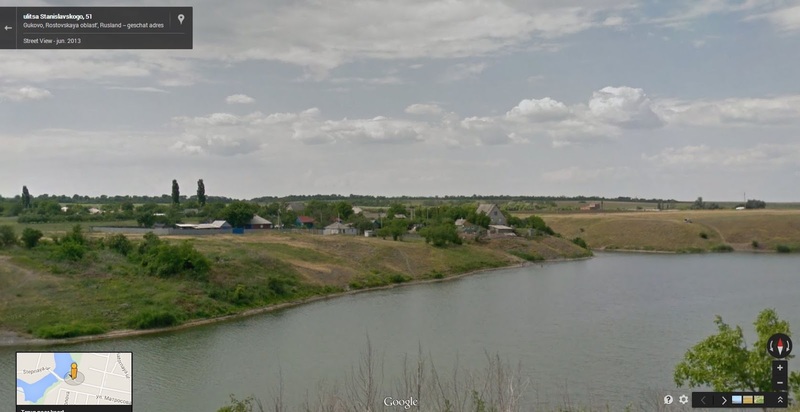 As can be seen, the Ukrainian border is still another 2 kms away. So the GRADs DEFINITELY are on Russian soil. 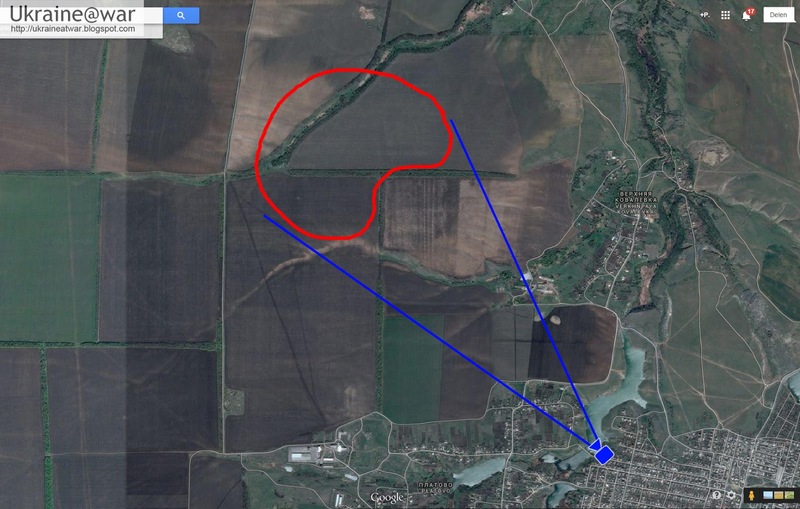 This is the area where the 79th brigade of Ukraine tries to secure the border crossing of Chervonopartyzansk (= Russian Gukovo). "Today, near the border of the Luhansk Region, the Ukrainian 72nd batallion, consisting only of 15 Men were loading the corpses in the refrigerator car. At this time, we were fired at by GRAD rockets. Our Soldiers HAD to leave for shelter, but still five got seriously injured. The attacks did not stop, we HAD to retreat. The terrorists fire drove the Ukrainian soldiers on the territory of the Russian Federation, where they were waiting for by the FSB. The team members were arrested, and every single one WAS taken to hospital in the Russian Gukovo. Now, the Hospital is aurrounded by police of the Russian Federation, in the building are dozens of Russian journalists. ATO Guide contacted Border Service of Russia on the border issue of the Ukrainian Side, but they recommended to contact the supreme commander of the armed forces of the Russian Federation and hung up. " Rocket engine stop at 38:06. Sound stops at 43:20. This is 5:14 frames = 5,6 seconds, corresponds with 1.900 meters. 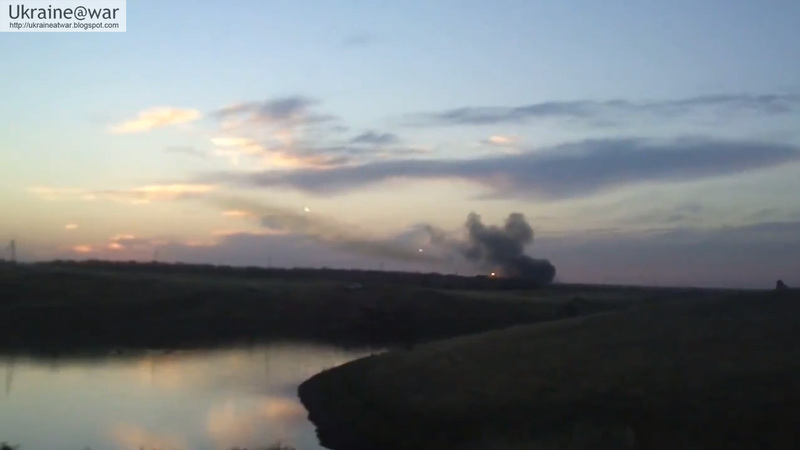 Note that this is not the first time that Russians are firing GRAD rockets across the border. On July 11th it was the first time when an entire Ukrainian camp/convoy had been destroyed near Zelenopole. see this blog. There it was already reported that the fire came from Russian soil. This is the first time is in recorded on film and can be geolocated and thus undeniably proven that it comes from Russian soil. Basically the Russians are doing this ALL THE TIME already ...!!! 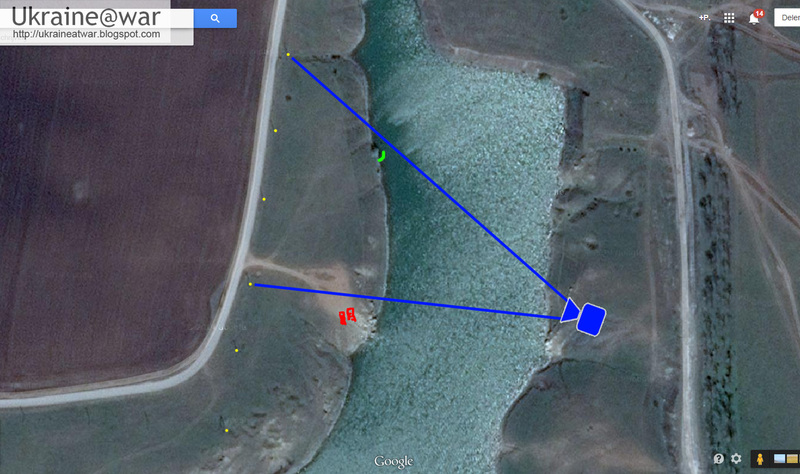 The difference is: now it is filmed and pinpointed down to an exact location. 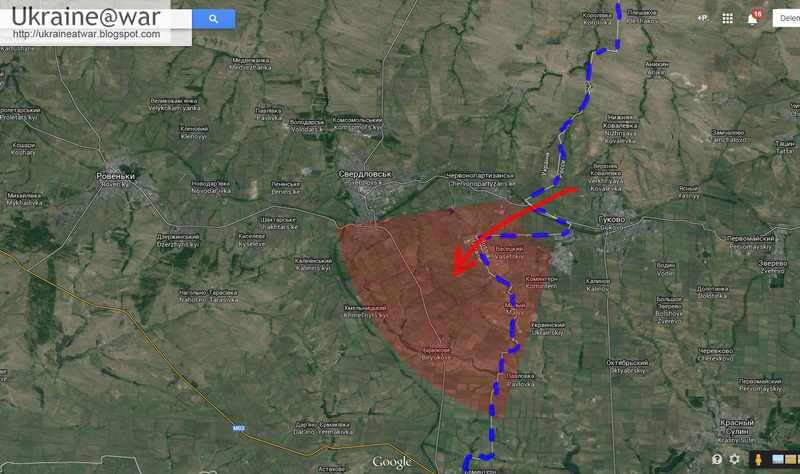 Red circle = area where the smoke may come from. As can be seen, there is overlap with the positions in the other two videos. Still I have some serious questions about this last video. The smoke looks a lot more like smoke from impacts and/or burning things. Neither do we hear any noise from launching GRAD rockets as in the other videos. And we do not see the burning engines of the rockets either. 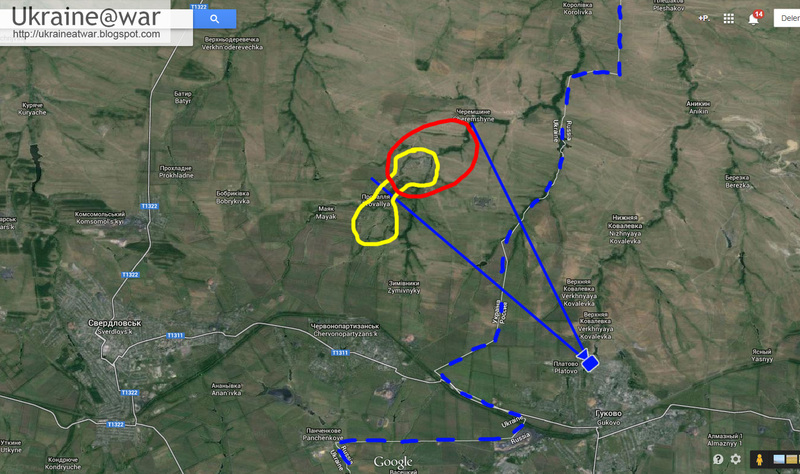 So it looks like Ukraine is shelling back unto the GRAD positions here? Wow! It means Ukraine is fighting back ON RUSSIAN TERRITORY. 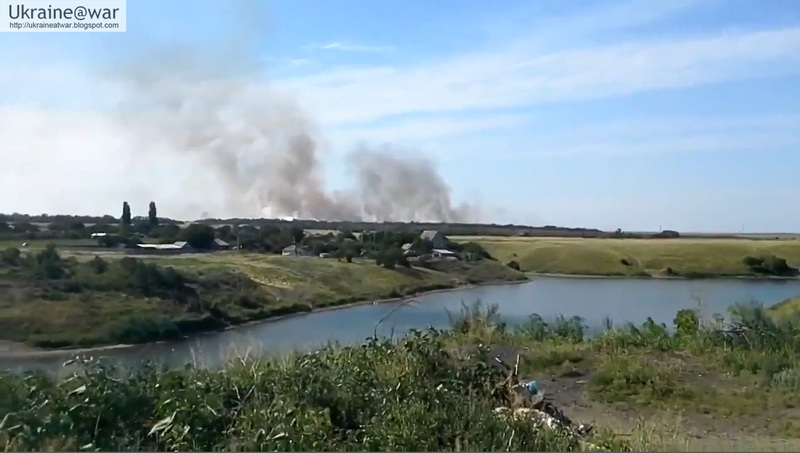 Euromaidan says the town of Provallia is on fire in this video. 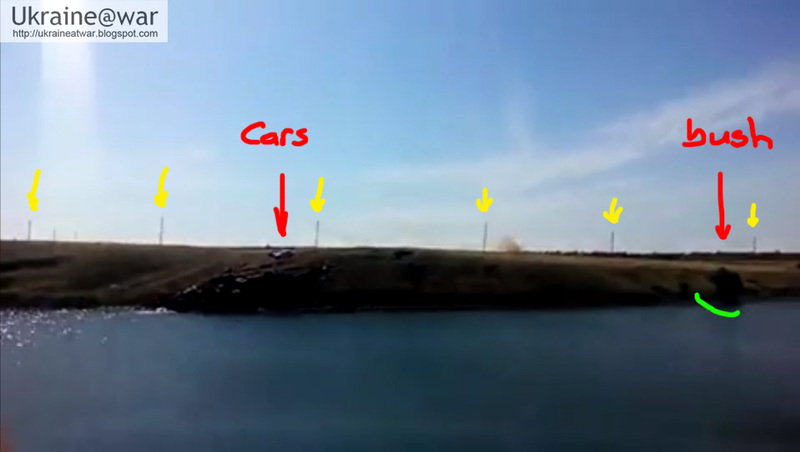 This could be possible, because the southern part is well in range of the firing in the second video. 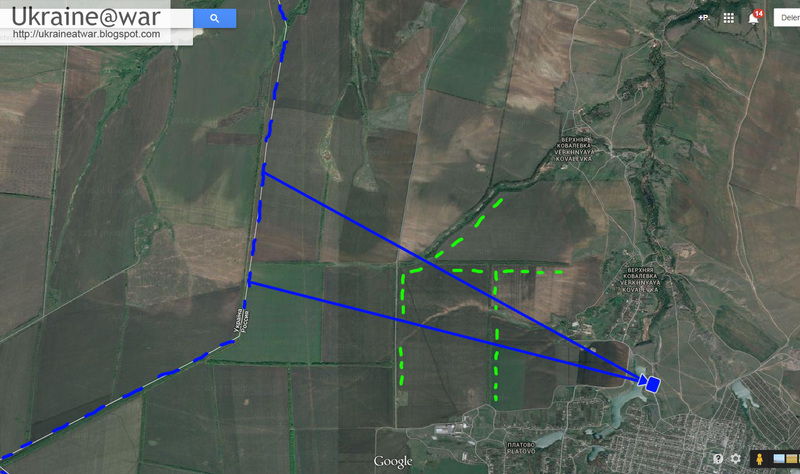 It DOES overlap the northern part of the village, but it does NOT overlap the southern part. And it was the Soutern part that may have been in range. This doesn't mean the village was not hit. Very likely there have been many more launches that have not been recorded. Nevertheless the smoke seems too close by to be in the village. It looks like the smoke is right behind the tree line. 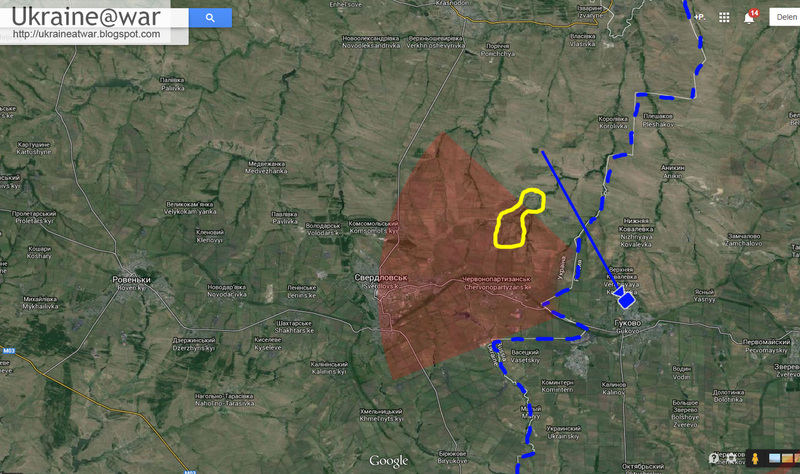 So for now, I still opt for the possibility that Ukraine has been firing back at Russian soil. And they would have been crazy if they didn't! One might say: "Why didn't Russia blame Ukraine for firing into Russian territory?" Some guy talking and filming the filming-Location for a long time. I have been told he talks about his childhood etcetera. But the second part gives a good impression of the area. Russian soldier post photos on his VKontakte-page about his unit shelling Ukraine with heavy artillery from Russian soil. Read blog. It isn't "team members" but "FSB agents," i.e. literally the source said "Komitetchiki" which is a slang word for FSB, based on the old name for agents of the KGB, which was Komitet gosudarstvennoi bezopasnosti. Oh, Ukraine :'( My heart just breaks for you. May God Bless you and give you strength in your brave fight against the terrorists. Ask your minister of defense to 'come clean' with the casualty figure for this Russian outrage. 19 dead doesn't come anywhere close to the numbers of sons, brothers and husbands killed. - some where totally incinerated and of others only isolated body parts were left. more than 60 vehicles including tanks totally destroyed. The men just settling for sleep were killed in their beds. There had to be treachery of some kind for the Russians to strike a target so accurately over a range of more than 40 KM. Like the number of prisoners taken, and the amount and types of weapons captured by the enemy, Yats, Turchy, Porko and the gang are running a "be happy, we're winning" advertising campaign at the expense of suffering soldiers and real patriots..
+popsiq I am ex Australian Special Forces, fought in 3 wars, and would gladly fight beside your "brothers" against the monster that is Putin's Army and the "pretend ones called "rebels"